In and out of the classroom, on and off the sports fields, our teachers artfully stretch our Middle School students further than they think they can go but do so with the compassion children need to triumph boldly over challenges. In fifth and sixth grade, children become more autonomous. A strong adult presence and small classes help usher children through these critical transformative years. This is especially important as they begin the natural process of developing independence from their parents. In Middle School, they are given more responsibility and must develop sound study and time management skills. They continue to practice and master their academic competency and push their creative and critical thinking. They hone their ability to apply their knowledge toward more sophisticated analysis and synthesis across subjects and disciplines. They also participate in collaborative projects which teach them to work together by accepting and giving feedback to their peers – critical skills for success in life and in the workplace. In the Middle School, students continue to practice and master foundational skills. At this point they are also ready to apply these skills to deeper, more advanced concepts in the same subjects or to novel situations in new subject matter. Language Arts: Cultivate an appreciation of classic and contemporary literature and strengthen their writing skills. Mathematics: Participate in a rigorous math program that stresses the importance of computational and estimation skills, as well as the application of logical thinking and problem-solving. Science: Learn scientific methodologies through a variety of hands-on experiences in Earth, life and physical sciences, with a focus on geology, weather, the human body, electricity and bird identification. Social Studies: Study history, geography and current events while developing skills in research, note taking, outlining, mapmaking and synthesizing information. Art/Music: Participate in the visual arts, woodshop, Maker Lab and drama. Kirsten Rosolen has been Head of Middle School since 2005. She started her teaching career at Country School as a Grade 5 apprentice and then became a Grade 5 homeroom teacher. An alumna of Choate Rosemary Hall, she returned there for many summers to teach and work as the Director for the CONNECT Math and Science Program for Middle School Girls. Kirsten earned a B.A. in Biology from Bucknell University and an M.A. in Teaching, with a focus on Middle School Education and Administration, from Sacred Heart University. In addition, she was a fellow in Vanderbilt’s Peabody Professional Institute for Independent School Leadership. Recently, she presented on Mission Skills at the annual National Association of Independent Schools and co-authored the article, "Building Character: How Can Independent Schools Ensure They Teach What They Profess?" Kirsten has also served on the Board’s Advancement Committee and Master Planning Committees. Kirsten is active in the Connecticut Association of Independent Schools (CAIS) and the Fairchester Middle School Heads groups and was a member of a school accreditation team. She enjoys playing pickle ball and cooking. Kirsten and her husband, Matt, have two children. At New Canaan Country School, we believe that being academically well prepared is simply not enough. To be successful in life, we want our students to have a combination of both competence and confidence. 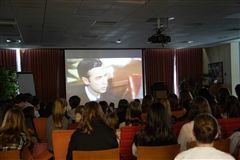 As a continuation of our community conversations on social and emotional well-being, diversity and inclusion, Middle and Upper School students watched select scenes from the film Won’t You Be My Neighbor?, a documentary on Fred Rogers and his television show, Mister Rogers’ Neighborhood. The scientific experiment of Jane Walsh, a Country School 7th grade student, has been selected as the National Challenge Grand Prize Winner of Cornell University Lab of Ornithology’s K-12 annual magazine, Birdsleuth Investigator. 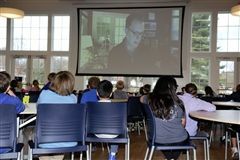 Fifth grade science students interviewed Atlanta-based meteorologist Carl Parker via teleconference Wednesday. The interview, led by Middle School Science Teacher Lindsay Frey, was part of a larger study on the forces that drive weather patterns. One recent afternoon, in the innovation space in the Schlesinger Library a pair of sixth grade students were adding aluminum foil to rubber tiles to create a musical hopscotch pad. In another corner, a group carefully attached wires to a handful of gummy bears (snacking on a few at the same time), while a third furiously colored with pencil on a piece of plain copy paper.